A former regional journalist who died this year is to be given the ultimate accolade for his unselfish devotion to a community he served for half a century. A passage near the new Johnstone Town Hall will bear the title Parker’s Way, as a lasting tribute to the long-running Paisley Daily Express column of the same name which was first penned by Derek in 1965. Renfrewshire Provost Anne Hall said the move is a fitting memorial to nature-loving Derek, who was still a student when he penned his first Rambles column – which shed light on the secrets of the region’s historic towns, villages and countryside – for the Express. She added: “There have been lots of ideas as to how Derek’s life and legacy could be commemorated and I am sure there will be other suggestions on how to do that. “For now, I am delighted there has been strong local support for naming a road after his much-loved column about Renfrewshire. He had two spells as a full-time journalist at the Paisley daily – from 1970 to 1976 as a sub-editor and again from 2000-2008 when he finally retired. In between he had a three-year spell at the Johnstone Advertiser where he finished as its chief reporter. Outside of journalism he gained a theology degree in the late 1970s; worked as a countryside ranger; helped with flower and butterfly conservation at the RSPB as well as charitable causes like St Vincent’s Hospice in Johnstone and the Anthony Nolan Trust. Sport also played a big part in his life. 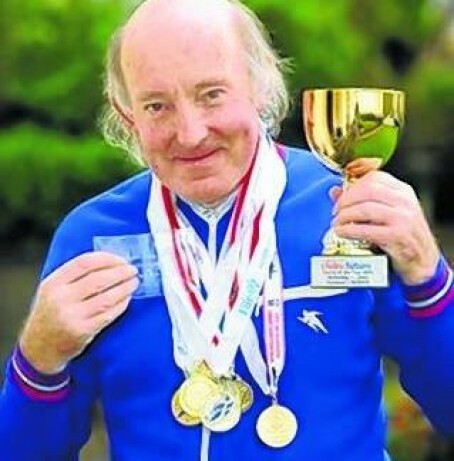 Derek first got involved in athletics as a teenager in the 1960s, and competed as a sprinter with the Paisley Harriers club. He went on to complete more than 50 half marathons and ran the London Marathon twice, before enjoying more success as a coach – inspiring athletes to compete at Olympic Games, World Championship, European and Commonwealth standard. Derek coached at Paisley Harriers and Kilbarchan Amateur Athletic Club. In 2005 his lifelong commitment was rewarded when named Performance Coach of the Year at the scottishathletics Annual Awards. Councillor John Caldwell, deputy provost of Renfrewshire, said: “Derek was a very unique character. Very moving. Sadly some councils don’t see a reporter from January to December, let alone name anything after them. RIP.